East Village Association | West Town Chicago: What's on tap at Do-Division? OK, Pabst. What else? What's on tap at Do-Division? OK, Pabst. What else? Division Street closes to at least some traffic this weekend from Ashland to Leavitt for the Do-Division Street Fest and Sidewalk Sale. 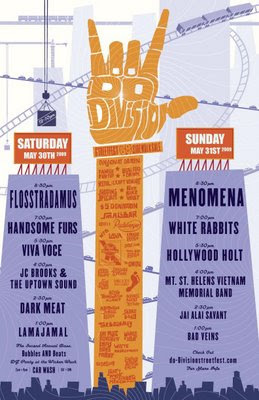 This year's live music at Division and Damen features Montreal indie rockers Handsome Furs, Mizzou ska-clubbers White Rabbits, Oregon punk/funk/crunk artists Menomena and Chicago DJs Hollywood Holt and Flosstradamus. The main stage again is scheduled by Empty Bottle Presents, festival-booking extension of the Empty Bottle nightclub in Ukrainian Village. A separate stage on west end of the street festival at Division and Leavitt will benefit LaSalle II Language Academy, 1148 N. Honore, and A.N. Pritzker School, 2009 W. Schiller St. The Family Fun Fest includes performances for children, a bounce house, face painting, crafts, cookie decorating, petting zoo and pony rides. Division Street boutiques are to hold sidewalk sales. Concessions will feature Pabst Blue Ribbon beer. Admission is $5. Hours for the West Town Chicago Chamber of Commerce event are noon to 10 p.m. Saturday and Sunday. The kids' stage closes at 6. The emerging artists exposition Around the Coyote takes place alongside the festival, in the Splat Flats art space above Miller Lumber at 1815-25 W. Division, with more exhibit space at 1000 and 1234 N. Milwaukee. Tickets are $20.